The next time you’re in line at a coffee shop or food court, try being more attentive and reflective — it could help you make healthier choices. 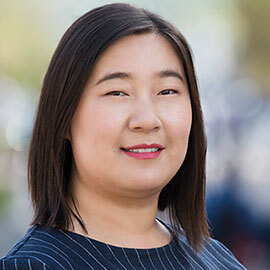 With funding from the Social Sciences and Humanities Research Council, Laurier graduate student Wan Wang has been researching the benefits of mindfulness and healthy eating as part of her PhD in social psychology. Working under the supervision of Laurier Associate Psychology Professor Christian Jordan, Wang studied 100 Laurier students, who were recruited through the Psychology Research Experience Program. Wang found that mindfulness — defined as a conscious, non-evaluative state of being attentive to and aware of present events — predicts healthier eating behaviour. With origins in Buddhism, mindfulness is a conscious state of living in the moment. It is a dispositional capacity that varies across individuals; yet previous research shows that more mindful individuals report greater self-esteem, life-satisfaction and happiness, and self-regulation capacity. To assess dispositional mindfulness, Wang had students complete a mindful attention awareness scale. Test participants were then put through a mentally challenging task or an easier, control condition task. Wang and her team then measured their attitudinal preferences for fruit and sweets using a feeling thermometer. Wang found that the more mindful individuals reported greater attitudinal preferences for fruit over sweets and were more likely to actually choose fruit to eat. In fact, more mindful people made healthier snack choices independent of whether they were mentally drained by the challenging task. Wang began studying psychology during her undergraduate degree at the University of Winnipeg, and as a master’s student at Laurier. But her interest in social psychology started at a young age while growing up in China. Historically, Wang says, research on eating and mindfulness has focused on individuals suffering from eating disorders. But she has seen a shift in how social and even clinical psychologists are conceptualizing mindfulness and eating behaviour for the general population. “In social psychology, we largely focus on studying mindfulness as a general quality of attention and awareness,” says Wang. “Psychologists have been able to convey mindfulness in a scientific way to actually make incremental change in every day life,” says Wang. Mindfulness meditation has been used successfully in treatments for depression and anxiety. Wang says that inducing mindfulness in daily life can gradually help people improve their mental health, and — as her study shows — preferences for and choice of healthier food. There are several reliable ways to induce mindfulness in brief experimental sessions, says Wang. One common way is to let people hear 10-15 minutes of guided meditation that has them gradually notice breathing patterns and sensations from head to toe. Another way to induce mindfulness is to let people eat raisins while being fully aware and nonjudgmental — having them notice the taste, the texture and the feeling on the tip of their tongue. Learn more about Wang’s research by reading her co-authored article in Personality and Individual Differences. Try to slow down and think about the benefits of healthy, less calorie-dense food before making a choice. You can easily practise mindfulness during your daily routine activities, such as eating, walking, relaxing and showering. Try to use all of your senses to notice every aspect of what you are experiencing, and allow positive and negative thoughts and feelings to occur without elaborating on them. Wondering about your mindfulness score? Try this Mindful Attention Awareness Scale.